Holy crap! Literally! 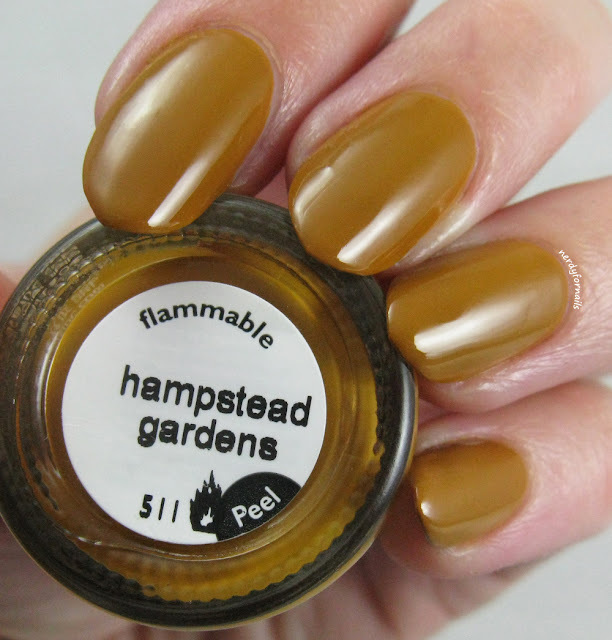 I've finally found the perfect shade of baby poo yellow and it's the ugliest polish in all the right ways. I've been searching for this exact color for over a year and I've finally found it thanks to the wonderful and quirky Concrete and Nail Polish. The second I saw her post I knew I had to have it. 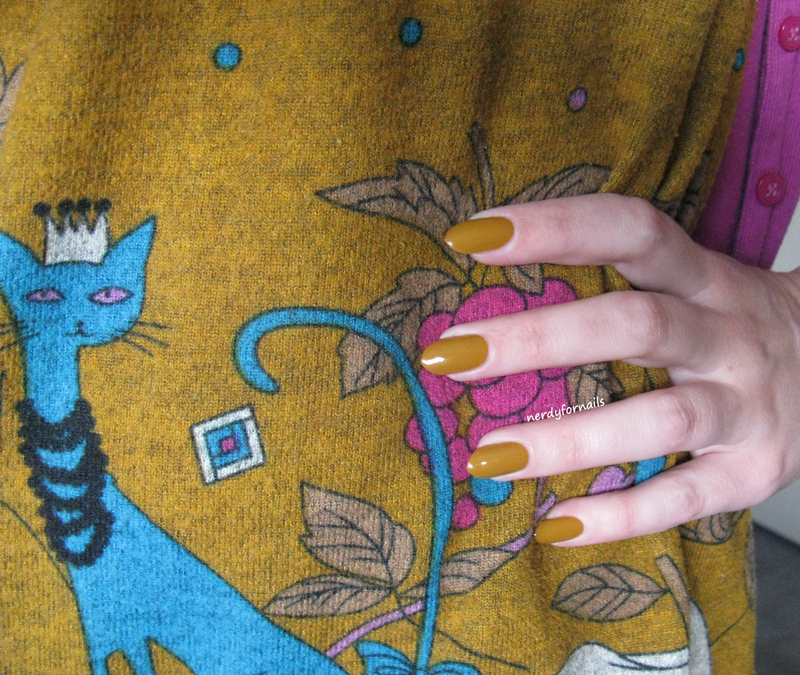 Hampstead Gardens from Nails Inc is a perfect match for this ridiculously ugly kitty shirt that I found at a yard sale, and yes, I wear it all the time... because cats. Last fall I tried to franken a matching shade for this top, but couldn't quite get that dark mustard base that it needed. I didn't have any luck finding this polish though websites that normally carry Nails Inc but it was on eBay for a reasonable price. I don't know if you can really put a price on a polish this unique though. I probably would have paid much more to add it to my collection. The brush was a little wonky right out of the bottle as you can see. I trimmed those long pieces off with a tiny pair of scissors and the brush worked much better afterwards. 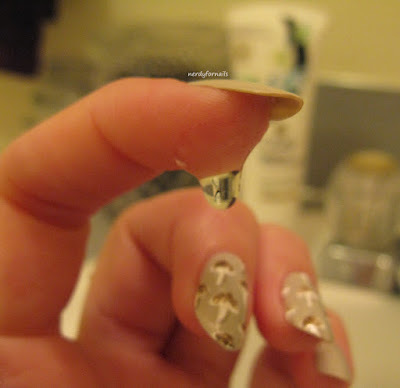 The formula has a nice consistency, not too wet or goopy. 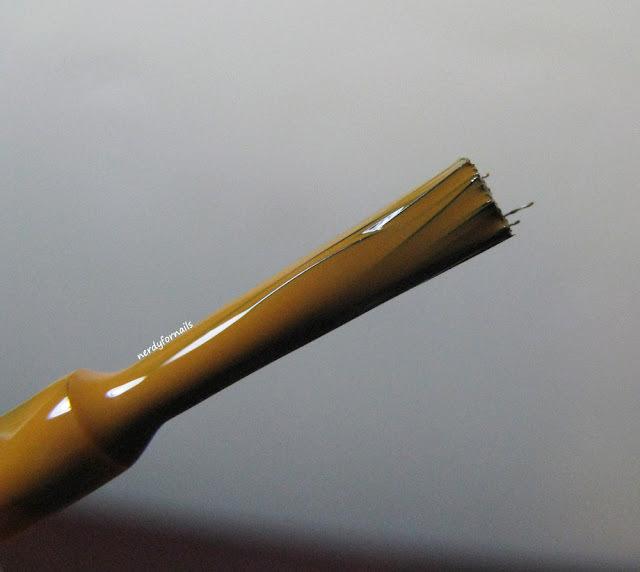 Two coats gives a perfect shiny finish. 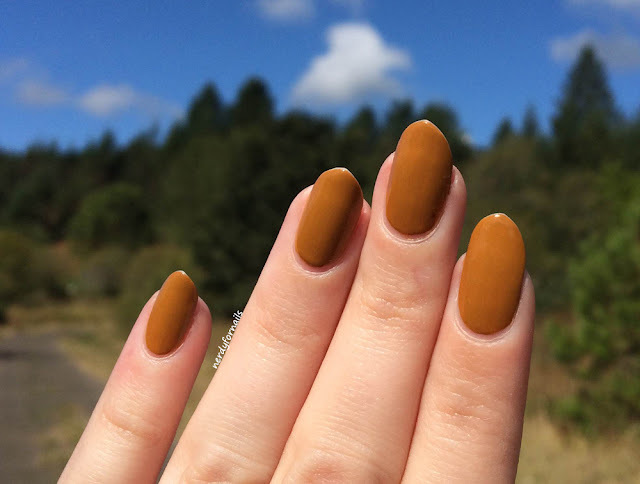 This is my perfect shade for fall. It's so much different from anything else in my collection. I don't often wear the same polish twice in a year, but I can see myself wearing this one again soon. Maybe some art to match the kitty shirt next time? It looks brilliant next to that blue sky too. Seriously can't get enough of this. What's the weirdest shade you've ever fallen in love with? 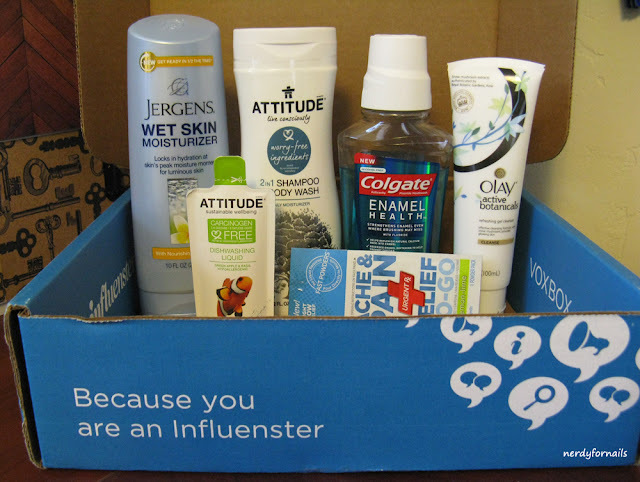 If you missed my last post I did a review of the Influenster Wellness VoxBox. One of the items was this Olay Active Botanicals face cleanser. 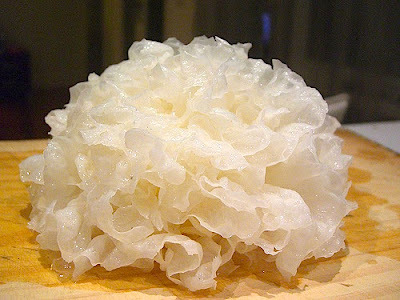 It's infused with snow mushroom and doesn't that just sound like the most adorable thing ever? Of course I had to google snow mushrooms. Not quite what I had pictured and that would have been a nightmare to paint so I did cute little button mushrooms instead. Thanks, internet, for this photo of a snow mushroom. You can check out my full review in the previous post. Basically this stuff is pretty ok. 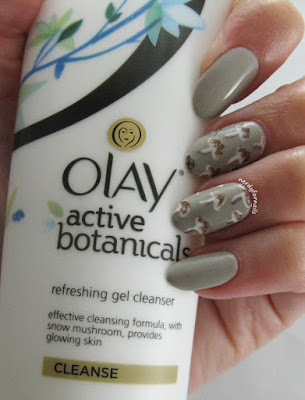 It was gentle enough for my sensitive skin and not overly scented. It wasn't too drying either which I've found is so much more important as my skin gets older and even more temperamental. As you can see below, only a small amount is needed to create plenty of lather. Ah, the interesting hand poses one comes up with when trying to show off slippery gel cleanser and nails in the same photo. 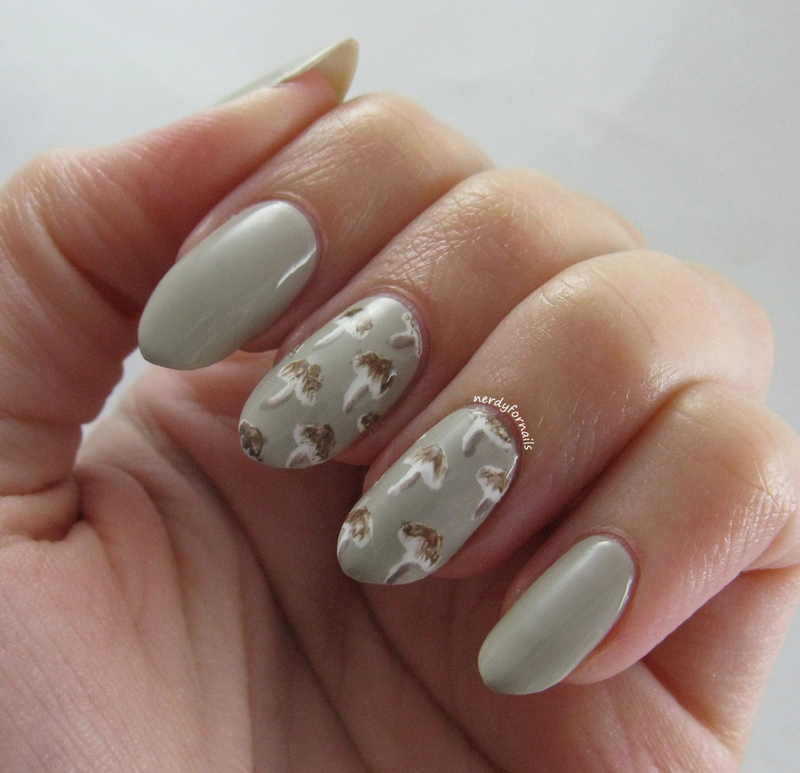 For these nails I started off with two coats of Five Rules from The Giver collection (China Glaze). I freehand painted the shape of mushrooms using white polish. Next, I colored the tops brown with Pumping Gas from Spoiled and then highlighted the stems with Chinchilly from Essie. I really like the way the small print looked. 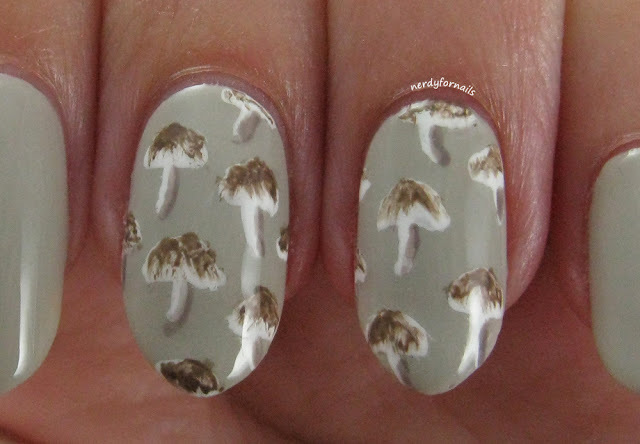 It would have looked so cute do finish out all the nails with the mushrooms, but I was running short on time so I went with my standard two accent nails. 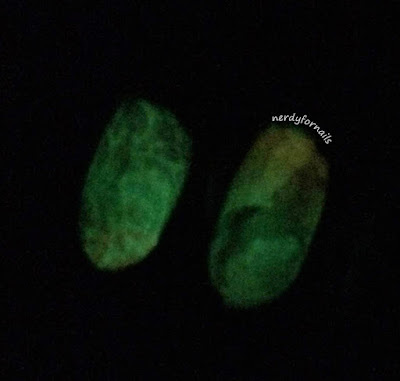 I had at least two people ask me if these were Jamberrys or stamped. I'm going to take that as a compliment. I think this means I need to come up with more cute patterns to paint. So, this whole moving thing.. It sounds like a really great idea until it's 100 degrees out and you're trying to shove your cat into a crate in the back of your car which is stuffed to overflowing with various computing equipment and house plants. And then at the hotel the cat finds the one tiny hole in the box spring cover and spends half the night bumping around under the mattress whine/growling. And then you get to the new apartment and spend the next week living in a box maze to rival the one in Maze Runner (btw, look at these awesome Maze Runner nails I did here and did you see the next movie is coming out soon?). Moving makes me rambly, I think. It also makes me really bad at blogging. I didn't plan any posts ahead so I took a few weeks off to get resettled and I should be back for good now. The good news is I'm really enjoying my new job and living in Oregon. It's beautiful here and the weather has been perfect. I'm looking forward to the cooler winter months spent cozied up in my new office with all my nail stuff. 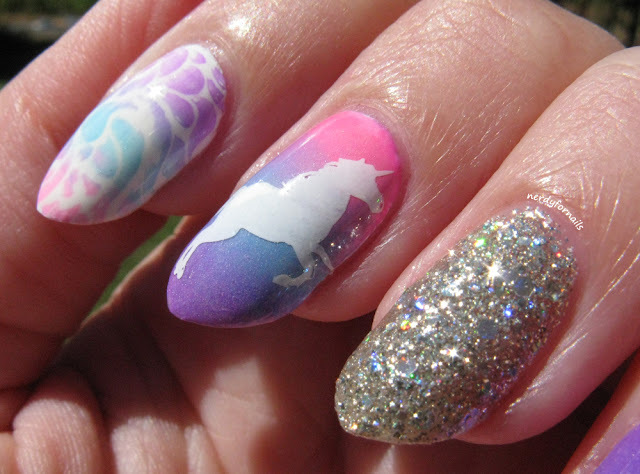 Now, let's talk about these nails. 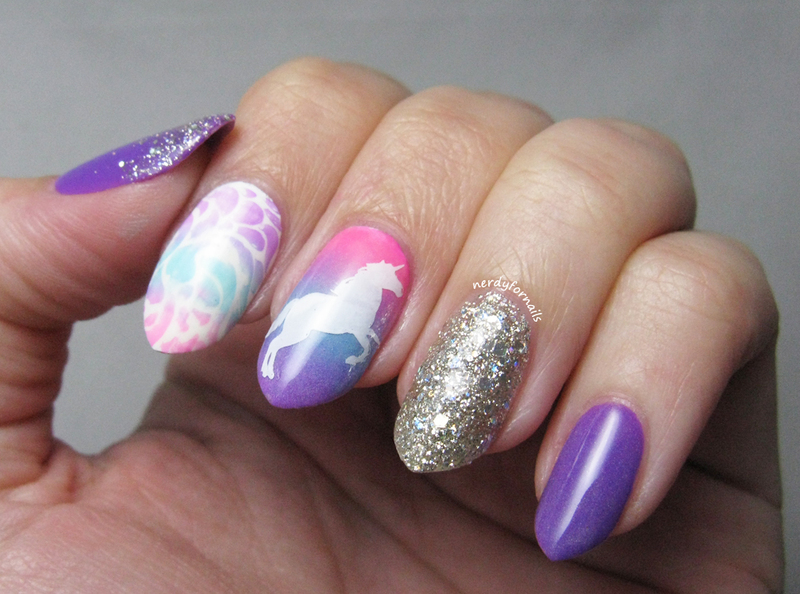 I needed something very magical for moving day and what better than unicorns and pastel gradients? The purple is China Glaze, Plur-ple and the pink and blue from the gradient are UV Meant To Be and Glow With the Flow (all from the Electric Nights collection). It also needed a very special sparkle nail. I used Cosmo from Zoya for this one. I can't say enough how much I love this polish! It's one of the Pixie Dust polishes and I expected it to be gritty, but it's not at all. The texture is subtle, and it packs a ton of sparkle. I did top coat it because I didn't want it snagging on anything while I was packing. One coat of top coat had it completely smooth. 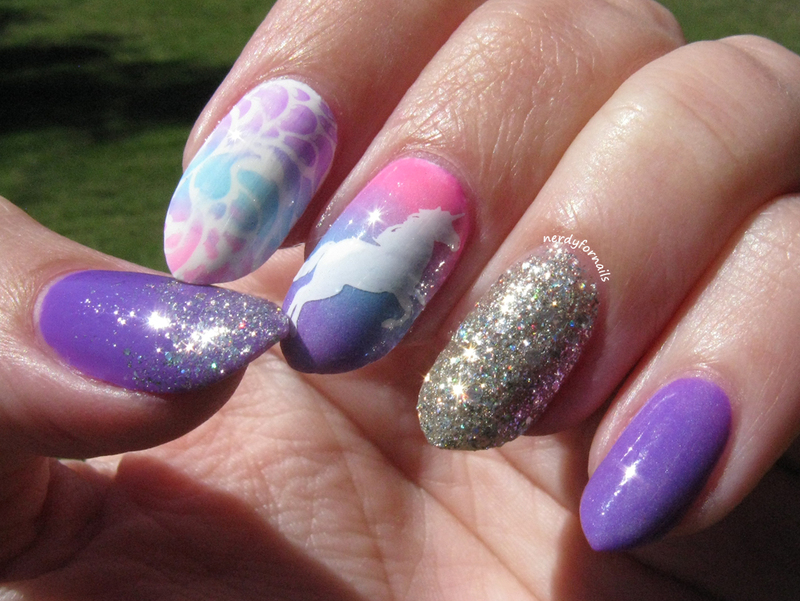 I also used stamping plates BM-615 and BM-406 for the unicorn and swirls. I topped off all the non-sparkly nails with China Glaze, Ghoulish Glow for a hidden surprise. Cosmo is amazing in the sun. I'm definitely going to need a full set of these nails soon. Surprise! Glow in the dark unicorn! 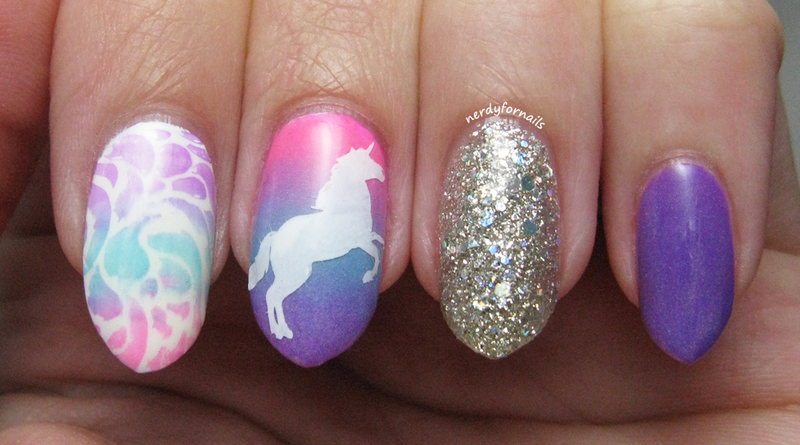 I did the stamping over the glow in the dark polish and you can just see the outline of the unicorn on top. 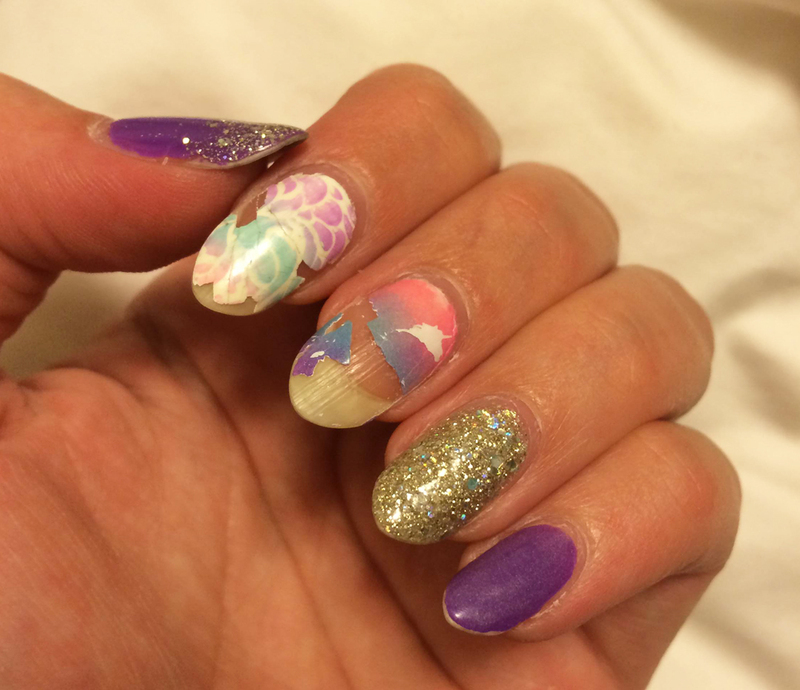 These nails were really fun and helped keep my spirits up though many long and tedious hours of packing and driving. Here's a rare sight: the saddest unicorn nails ever. It was almost two weeks before I had time to paint again and my nails and cuticles were looking awful... except for Cosmo. That polish wore like iron! It has barely any tip wear in the wake of the utter destruction of the other nails. I'm happy to say I've been thoroughly oiled, mani bombed and polished back into shape. I'm looking forward to getting back into my routine and showing you what I've been up to all these weeks that I haven't been posting regularly.